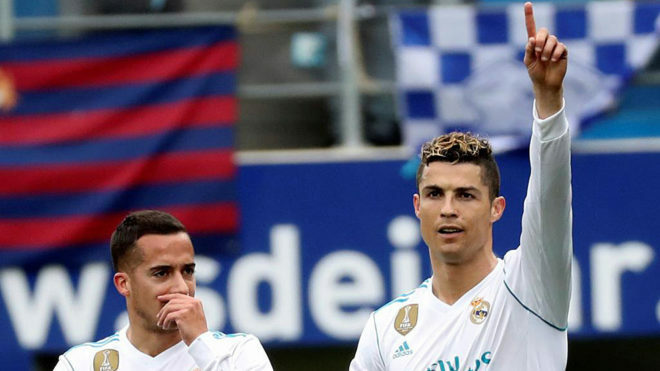 Real Madrid had to suffer to secure three points against Eibar, but they had Cristiano Ronaldo to thank as his crucial goal helped them to victory. Luka Modric also stood out and set up the opening goal against a side which refused to give up and only narrowly missed out on a point. Cristiano Ronaldo showed that he doesn’t only turn up for the Champions League but even at the least glamorous of all LaLiga stadiums. In Eibar, goalkeeper Marko Dmitrovic denied the winger from adding more to his brace which saw him continue to climb up the Pichichi standings. More than ever, the Portuguese superstar showed he deserves a pay rise given that he earns a net 25 million euros, compared to Lionel Messi’s 50m euros. After injury, Luka Modric also deserved praise with a return as if he had never been away. For such technical players, Estadio Ipurua proves a challenge but his pass with the outside of his boot, a move discouraged by Rafa Benitez, set up the first goal. He was involved in defence and attack and produced a superb display alongside the goalscorer. One man on the opposition team deserves praise too, as Dmitrovic produced two superb saves that will be in the running for save of the season. In the end though, the quality of Ronaldo shone through, even controlling the ball with his back to play himself in at one point. Dani Carvajal also deserves credit for his display, keeping Takashi Inui scoreless as Japan watched on, given the early kick-off time decided that had the Asian market in mind. Such decisions lead to more and more speculation regarding a European super league, but when European champions Real Madrid visit minnows in towns with less than 30,000 residents and almost drop points, it shows the true glory of LaLiga.